Thanks everyone for all your lovely comments on the last post - that project clearly struck a chord with many of you because it's been a while since I've received so many comments! 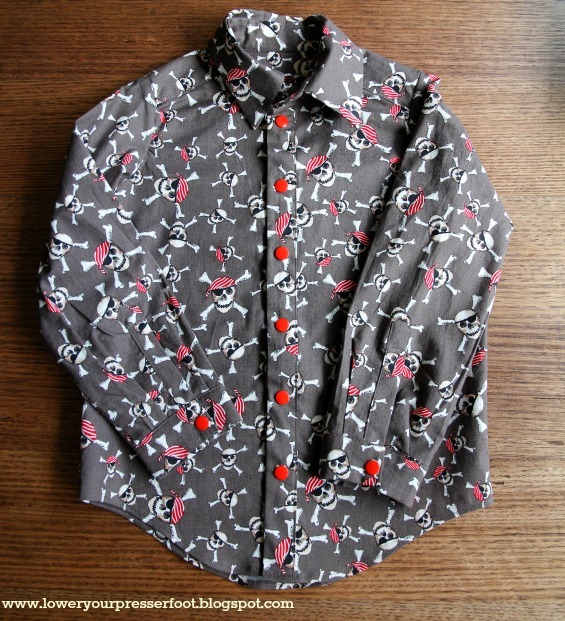 This year I let Toby pick the fabric for his shirt while we were shopping at the Remnant Warehouse a few weeks back and he picked out a pirate print cotton - such a typical boy! 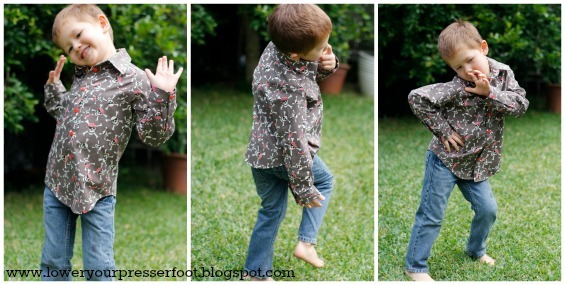 This shirt is a miniature man's shirt, complete with opening sleeve placket and pleated sleeves, which made it a little fiddly to make but it is a cute style. I left off the welt pocket at the front because I didn't think it would be that noticeable in this busy print. Instead of buttons I used plastic snaps so that he could get the shirt on and off himself. 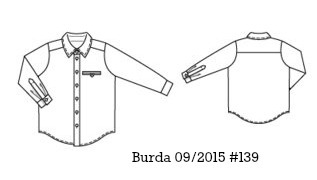 Size wise I found the pattern to run a little large, but in kids that grow quickly I guess that's a good thing but it was still a little bit of a surprise since I've found that Burda's kids patterns are usually spot on. 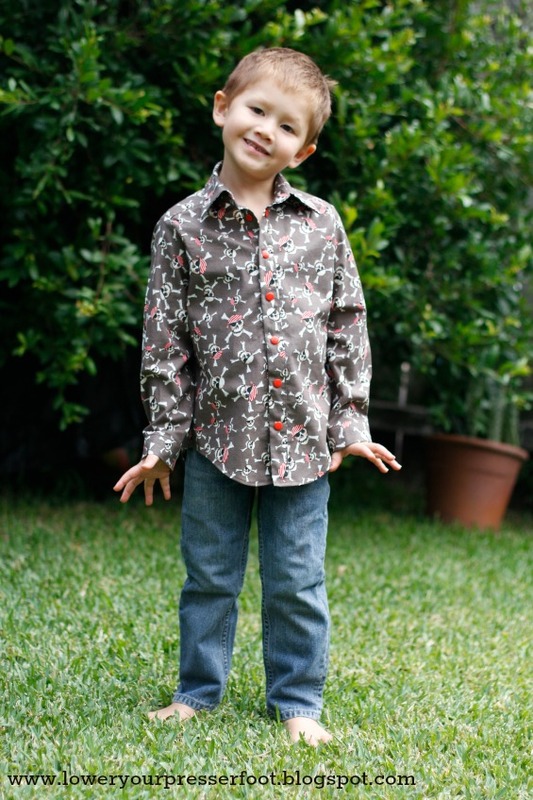 Toby's measurements matched those for size 104 perfectly and it fits him well around the body but the sleeves and the shirt seem a bit long. 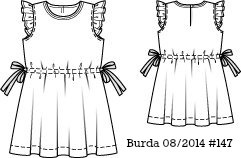 This is a super simple pattern - essentially just a rectangle, that I simplified even further by leaving off those ruffle sleeves and the ribbon tie waist - apparently 7 years old is too old for those features! And she wanted this dress shorter, which given that the main reason that I sew her dresses is because she's too tall for RTW dresses there was no chance of that. She is definitely growing up too fast for my liking. I used a rayon fabric bought from Spotlight quite a while ago, and sewed on some mini pom pom trim around the neckline to jazz it up a little. I also replaced the ribbon at the waistline with some elastic instead. 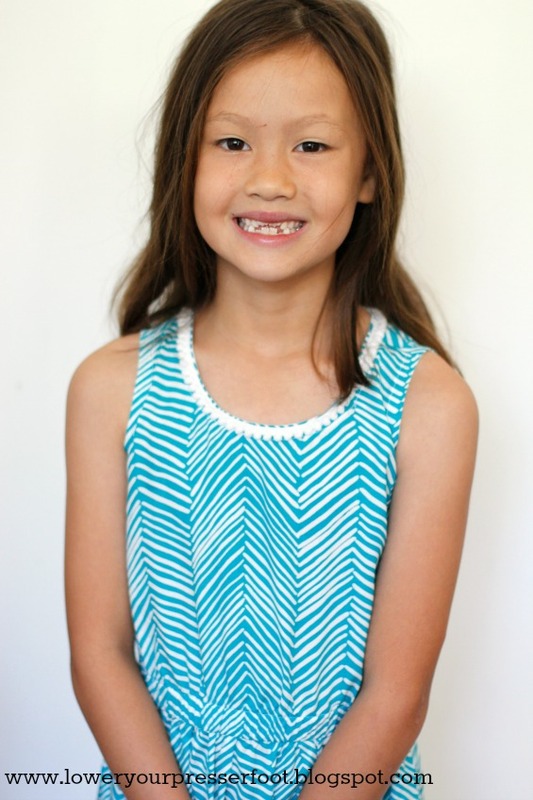 That gap-toothed smile seems to indicate that she's pretty happy with it! 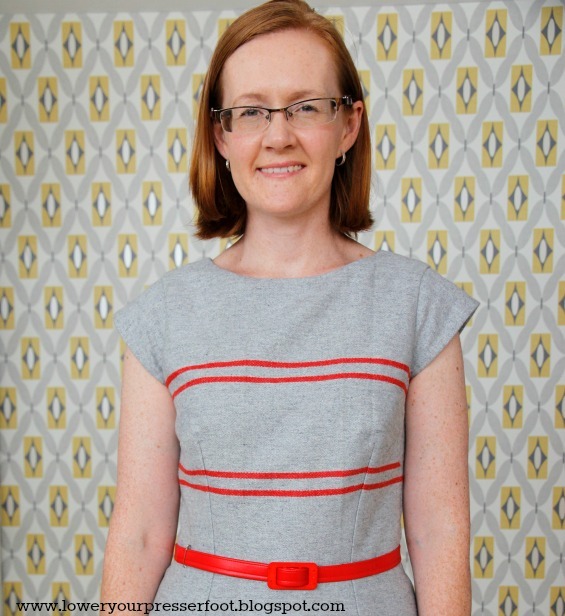 The Australian Sewing Guild is once again running a competition called 'Castaway to Couture' which requires entrants to refashion an existing garment into something new. The first prize is a Brother embroidery sewing machine, so if you are an Australian or New Zealand sewer you should definitely consider entering - you've still got until the 31st May so plenty of time. And if you're not going to enter yourself, well then - you should vote for me!! I've wanted to do something with this skirt for a long time because the fabric is so lovely. 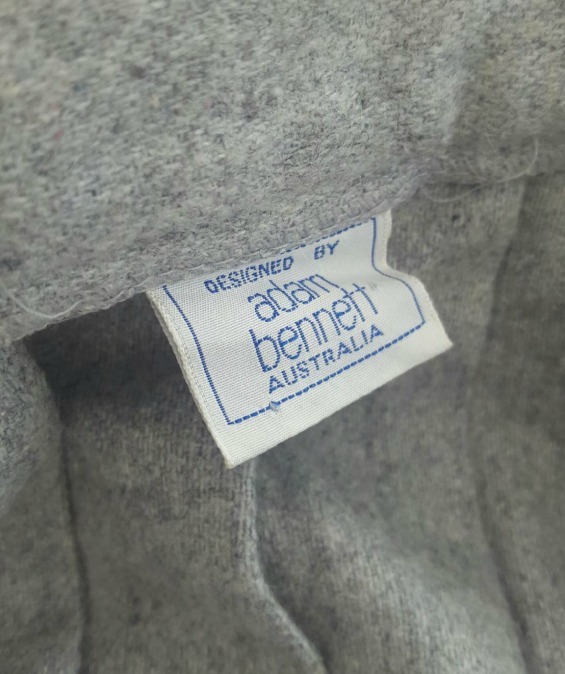 This is an Adam Bennett number, probably from the 1980s, and is made from pure wool. It was deeply pleated , but on me was too big and too long. It was really heavy too, due to how much material was in it. Originally I planned to keep it as a skirt and make it smaller to fit, but I couldn't just chop a bit off the bottom because it would lose the proportions of the stripes, and I couldn't just take it in at the sides either because it was just one long piece with just one side seam. The first thing that was required to was to get rid of those pleats. What a lot of work that was! If I didn't like this fabric so much I would have given up and just used one of the many perfectly good pieces of fabric in my collection. 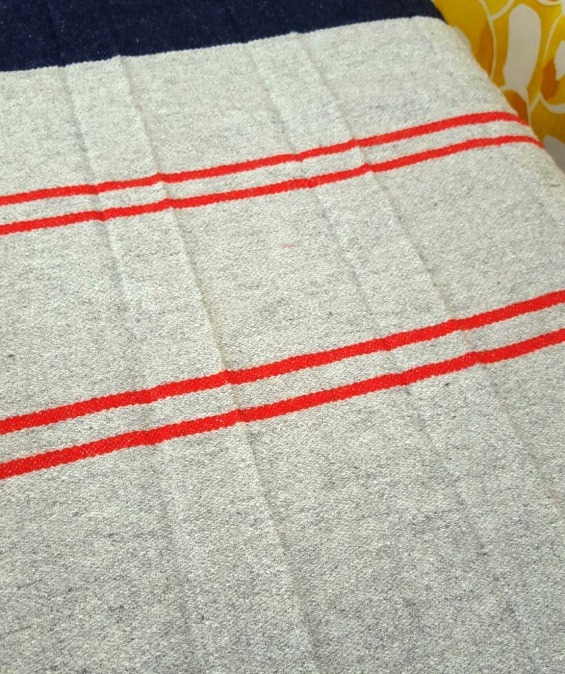 The fabric feels very flat and smooth, but what I hadn't counted on though is that a visible line would remain along the edge of the pleats despite all the washing. 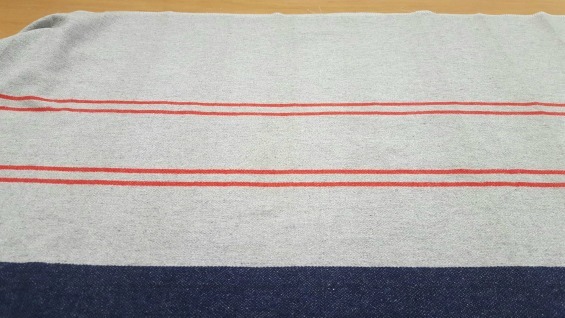 You can faintly see in the photo above the visible vertical lines - I've just decided that it is a design feature, and that the fabric has vertical self stripes in addition to the horizontal coloured stripes! These photos don't really show the vertical lines at all, but in the daylight they are quite noticeable. The lines are evenly spaced across the front, and I managed to line them up on the bodice and the skirt, so hopefully everyone else just accepts it as a deliberate feature. 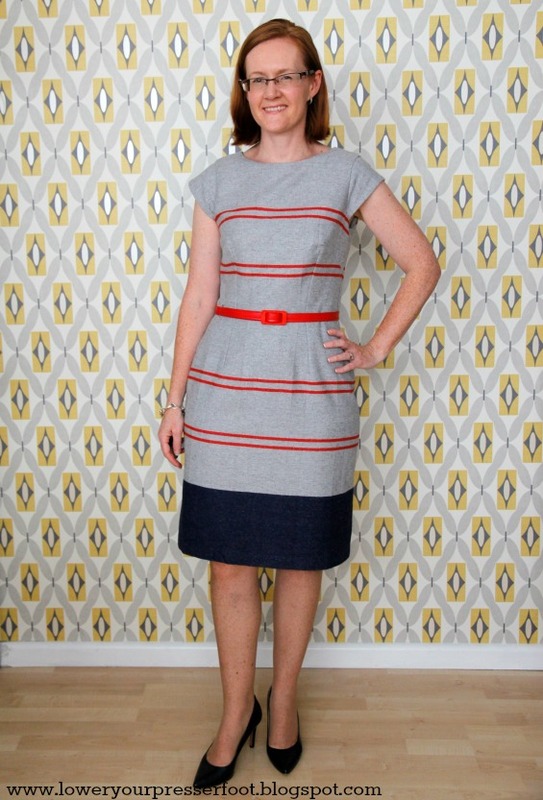 I used my favourite sheath dress pattern, New Look 6968, which I've used many times before with great success (see here, here, here, here and here!). Funnily enough one of those previous versions was a refashion too - obviously the simple lines of this pattern and the small amount of fabric needed are perfect for refashioning. 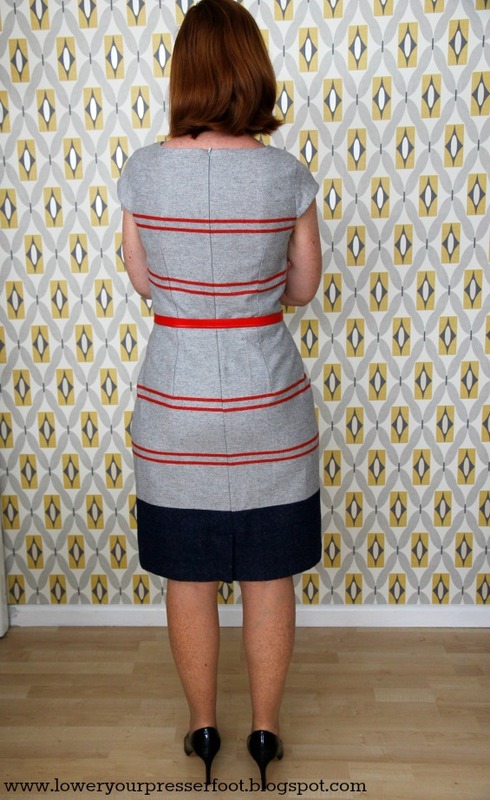 The reason I love this New Look pattern so much is that it has a waist seam with a separate bodice and skirt which means I can get such a good fit in the small of my back thanks to the waist seam and the darts. I find that putting darts into a single back piece never gets a close fit in my swayback as this style does. 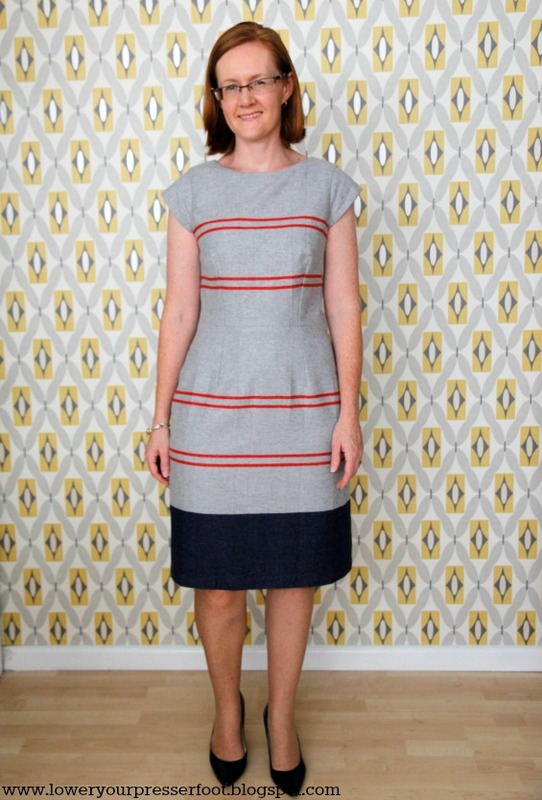 There's not much more I can say about this pattern that I haven't said before - it's a great basic pattern that is quite simple to sew. I made this one a size larger than previous versions I've made because this fabric has no stretch and those previous versions are all a little bit tight now (they must be shrinking while hanging in my wardrobe, I'm sure!). This size is really comfortable to wear, but there is a bit of looseness around the bust and below the waist, but I think a bit of ease is necessary in a form fitting dress with no stretch. 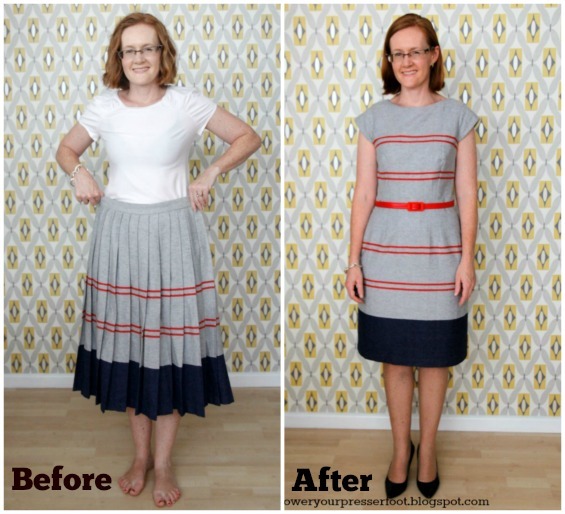 I've fully lined this dress in some lining that has been in the stash a long time, and even used an invisible zipper that was salvaged from another garment, so this really was a cheap project to make. Unfortunately this project doesn't make any dent in my huge fabric collection at all, but it's certainly a great addition to my wardrobe. So as I said at the beginning, the competition is open until the 31st May and I really encourage fellow Australians and New Zealanders to enter - who wouldn't want a fancy embroidery sewing machine or any of the other great prizes on offer?